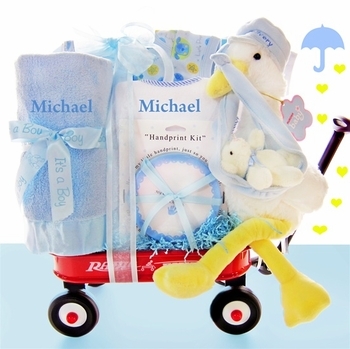 This memorable gift consists of a Mini Radio Flyer wagon that's filled with cute and practical items for the new baby boy. The personalization option adds baby's name on both the super soft large blanket and the terry cloth bib - an extra thoughtful touch. The hand print kit is a great gift for the new parents, as they can create a lasting keepsake of this special time. See More Images above for close-up pics of the Radio Flyer wagon. We always get such nice comments when we send these. We send to all of our advisors and staff when they have a newborn. ProsJust Unique. I don't see things like this on other websites. And you can call and get a live person if you have a question. ConsWish it could be mailed out a bit faster. I purchased this one for my sister when she gave birth to a baby boy just recently. She and her husband love the many items included in the wagon. Plus, the wagon itself is a hit to them. The baby items are cute and perfect for my nephew. ProsThe mom loved the many items included in the wagon. We bought this for our office manager. Everybody at the baby shower thought it was so cute! She didn't unwrap it at the party but told us that everything inside was great quality and useful. I would definitely order this again! Thanks!!! A very nice gift. Everything as described.